In this easy magic trick. 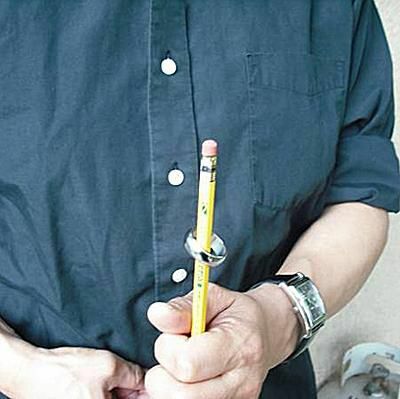 A finger ring that's resting on a pencil mysteriously levitates on its own. There's some preparation involved, but you should have fun with this one. If you would like to learn to levitate a pencil using a similar method, please click here. If you would like to learn another trick with a pencil, please click here. Using the clear adhesive tape, attach a bit of the thread to the top of the pencil, to the metal part that is just under the eraser. Hold the pencil in your hand, eraser side up. Run the other end of the thread to a button on your shirt or to a belt buckle. You'll need to anchor the other end of the thread on your body. If you choose to use a button, you can form a loop in the thread and wrap it around the button. If you like, you can also tape the thread to your belt buckle. Of course, you're free to attach the end of thread in any manner that you wish. You'll have to experiment a bit with the length. Basically, you'll want the thread to be fairly taut when you partially extend your arm in front of your body. The next steps will make this more clear. With your thread in place, hold the pencil in your hand, as shown in the picture. You'll want the eraser side up. Drop the finger ring onto the pencil until it's resting on your hand. Slowly draw your hand away from your body, which slowly tightens the thread. You'll see the ring begin to rise up as it rests against the thread. The picture shows how your hand moves forward, which makes the ring rise. This picture shows how the thread runs from the top of the pencil to a button or your belt buckle. The thread has been exaggerated for demonstration purposes. To make the ring descend, simply draw your hand toward your body and allow the thread to relax and drop the ring. Make sure that you practice this one so you get the length of thread correct, as well as the motion of the hand to cause the ring to rise. As with all magic tricks, it's important to always be considering how your spectators are viewing the trick and to minimize the opportunity for them to see and figure out the secret to the trick. If you're using black thread, you can wear dark clothing to help hide it. You should also consider your lighting. Dim lighting may be better than harsh and intense lighting that may highlight the thread by reflecting and cause contrast between the thread and its background. Also, the dim lighting will darken everything to help hide the thread.